Sarah spent two seasons working as part of a four-woman team at the southernmost British post office, at Port Lockroy on the Antarctic Peninsula. 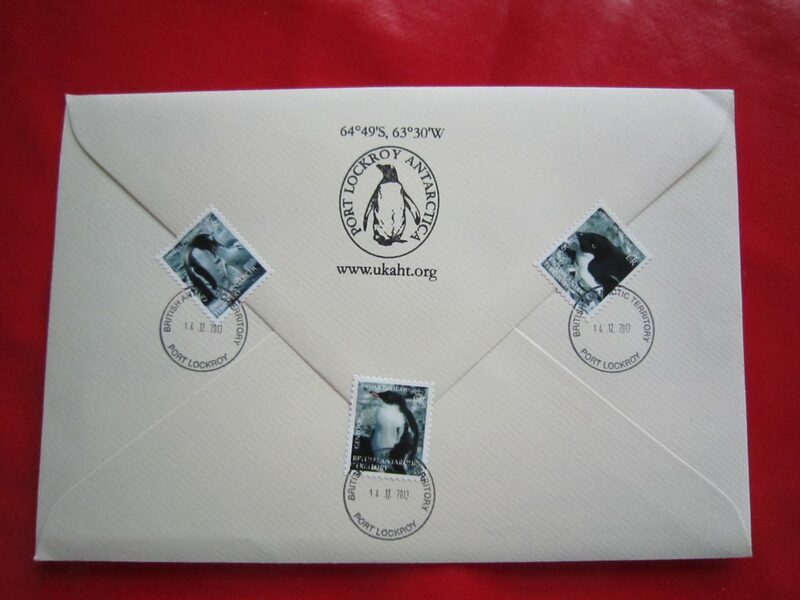 With penguins, whales, seabirds and the occasional seal for company, Sarah and her colleagues helped run a postal service for passing visitors. Here she tells us more about her unique experience. 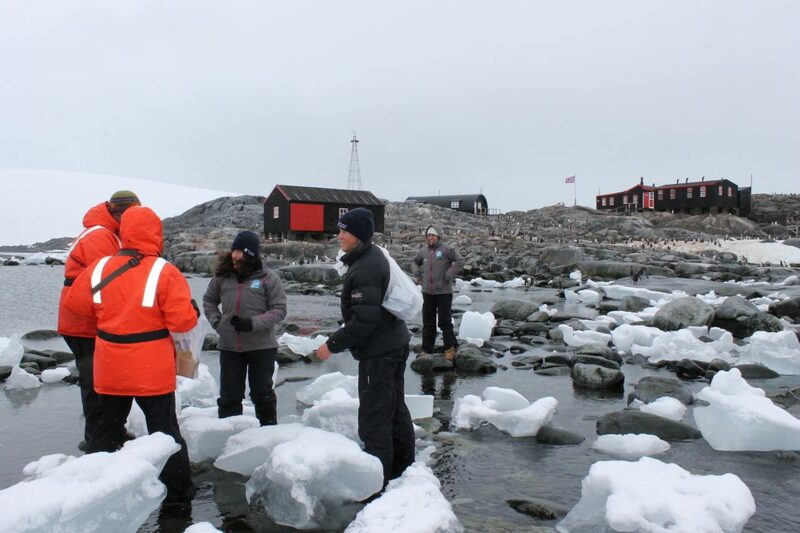 What is it like arriving at the Penguin Post Office at Port Lockroy? As you approach the Penguin Post Office, located on a tiny island off the Antarctic Peninsula, you are greeted by the “roo roo roo” sound of 600 pairs of nesting gentoo penguins. Early in the season, you may have to climb up a snow staircase, or later in the season find your way up the guano-splattered rocks to access the building. 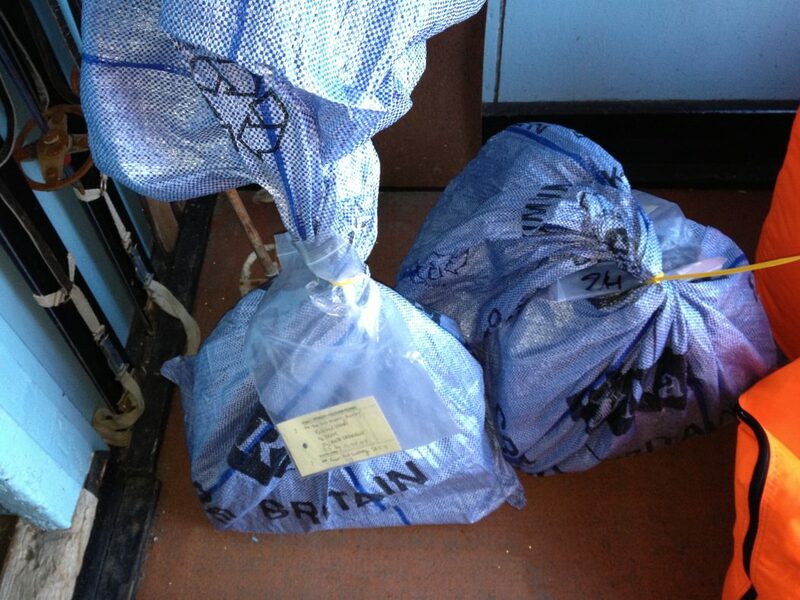 It is certainly not your average trip to the Post Office! Why were you at Port Lockroy? Port Lockroy Base A was the first British base along the peninsula. It became a historical monument in 1996 and now attracts up to 18,000 visitors a year. (The other British Post Office in Antarctica – Rothera – gets just two passenger vessels visiting it per season because it’s much more inaccessible.) 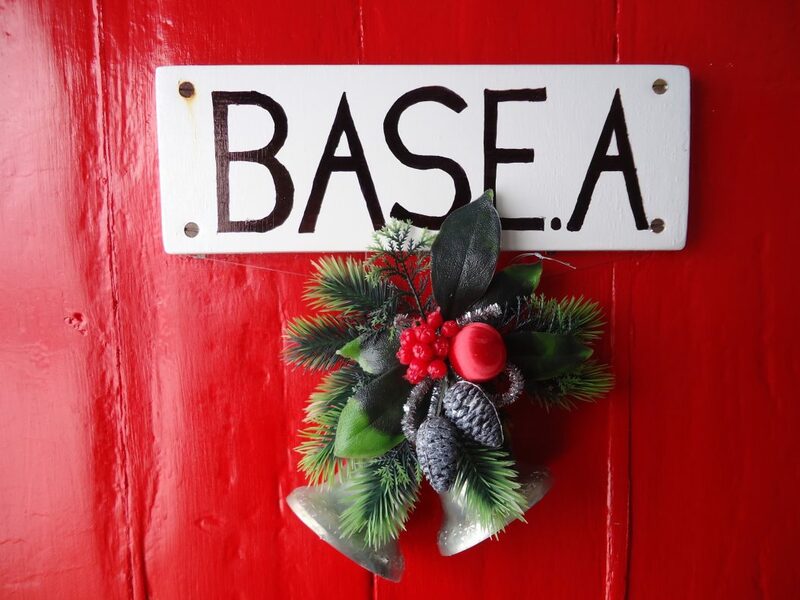 Each year the UK Antarctic Heritage Trust sends a team of four people to man the base from November to March. It was my privilege to spend two summers working on base between 2013 and 2015. Can you describe a typical day at Port Lockroy for us? As the sun never sets, days are long, but always enjoyable. The team wakes up around 7 a.m. – my morning alarm was the sound of penguins calling and snowy sheathbills knocking at the window. A typical day during high season very much revolves around ship visits – there would be two a day and sometimes a sailing yacht at lunch time. One or more of us would go on board the vessel first thing for a pre-landing briefing and perhaps breakfast – fans of bacon and eggs were always keen to get on board for this! In the meantime, the other team members would clear the path of snow or penguin poo and check that the shop was well-stocked and the museum ready for visitors. Visits usually last between two and three-and-a-half hours. Guests are curious about the buildings, keen to send their post cards and watch the local gentoos go about their business. At the end of the final visit of the day, we were often invited on board for a meal and sometimes even a much-prized shower! We’d also do any maintenance that was needed. For me this was a fun part of the job, as you get to spend time outside. My favourite job was cleaning and tar-coating the roof of the museum to make sure it was well-protected for the winter – it is an amazing spot as you get a 360° view of the area. It’s rare to get very much down time. On average the base assistants read just three books a season, and the base leader would be lucky to read 30 pages! What little free time you get is spent watching and photographing the wildlife, or writing postcards to friends and family. What did you eat on base? The Trust sends a single batch of food for the season – as you’d expect, tinned and dried food. Each team has different preferences. My first season the team didn’t eat baked beans, so the stock stayed for the winter for the next year. However, beans don’t fare well at low temperatures and when we opened them next season, they were all mush. We made it a rule to add a tin of beans to each stew to get rid of it all! Curries were always popular, though – we even had poppadoms and chutney! Visiting ships are very generous, often giving us fresh food (fruit, eggs, etc. ), or inviting the team on board for meals. A great meal is one that’s cooked for you – no washing, less ‘gashing’ (the term we used on base to describe removing the grey waste water and throwing it into the sea). What happens to mail deposited in the Penguin Post Office post box? Sending a postcard costs one U.S. dollar, no matter the destination. 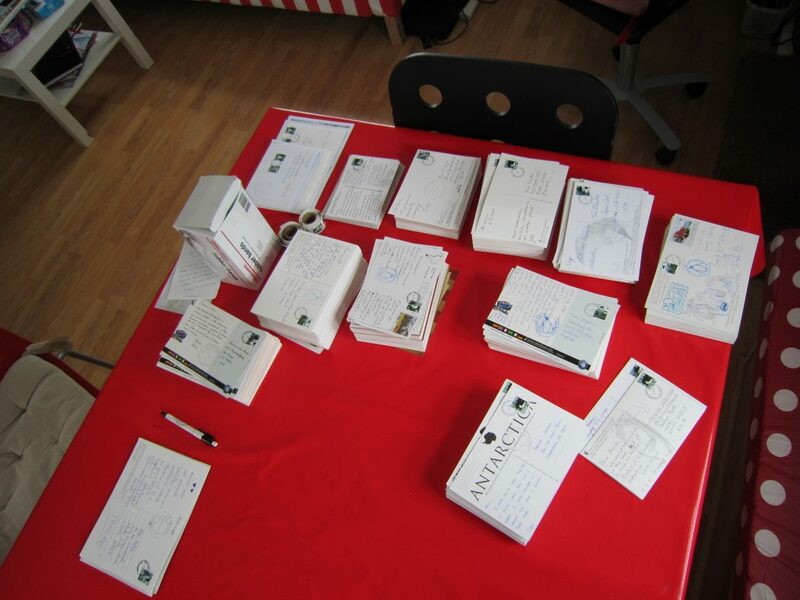 The team frank the mail by hand – on a busy day there can be more than 1,000 postcards. Then it is bundled, weighed – almost 500 kg of mail is processed by the team each season – bagged, and transported to the Falklands by an expedition ship, weather and ice permitting. Every postcard has quite a journey before reaching its final destination. Once the bagged mail reaches the Falklands, the Stanley Post Office puts it on the weekly Royal Air Force plane to the UK, where it finally enters the regular postal service. The fastest a postcard can travel from Port Lockroy to Cambridge is just over two weeks. However, it often takes longer, as the mail may not leave us for a week or two after it is dropped in the box. What’s more, at the end of the season, no ships return to the Falklands, so if you visit Port Lockroy after mid-February, your mail will most likely overwinter in Antarctica! Did you have any particularly memorable experiences at Port Lockroy? During my first season, we had a delivery of goods at 10 p.m. during a snowstorm. The conditions were far from ideal, but we needed the goods and the ship needed to clear the space – 400 boxes take up a lot of room! The ship’s crew helped us get everything onto the island, but we didn’t quite have enough tarpaulin to cover the boxes, and the boxes needed to be stored as soon as possible so that the cardboard didn’t collapse in the wet snow. A 100-metre walk in snow with 40 knots of wind against you feels like a very long way, and it was a real game of tetris trying to fit everything in the boat shed! We were struggling to find space, but around 4 a.m. the sky cleared, and we were able to cover the remaining the boxes and finally get some sleep. What qualities do you need to work at Port Lockroy? You need to be able to live simply. Living conditions are pretty basic – there is no running water, only one gas heater in the team’s living quarters, and you may get one shower a week on a visiting ship if you’re lucky. You also need to be able to live with just a small number of people, yet also be very sociable, as you meet about 300 people a day. When I left, I really missed the light and the tranquility of the island, and the absence of phones and internet. On base you can be connected to what is actually around you without the constant distraction of the online world. Do you ever get used the smell of penguin poo? It’s just like working on a farm. After a few days you don’t smell guano anymore and the low temperatures help keep the smell down. You only realise you smell just like the neighbours when you go on a ship for a quick briefing and you haven’t had a chance to have a shower! 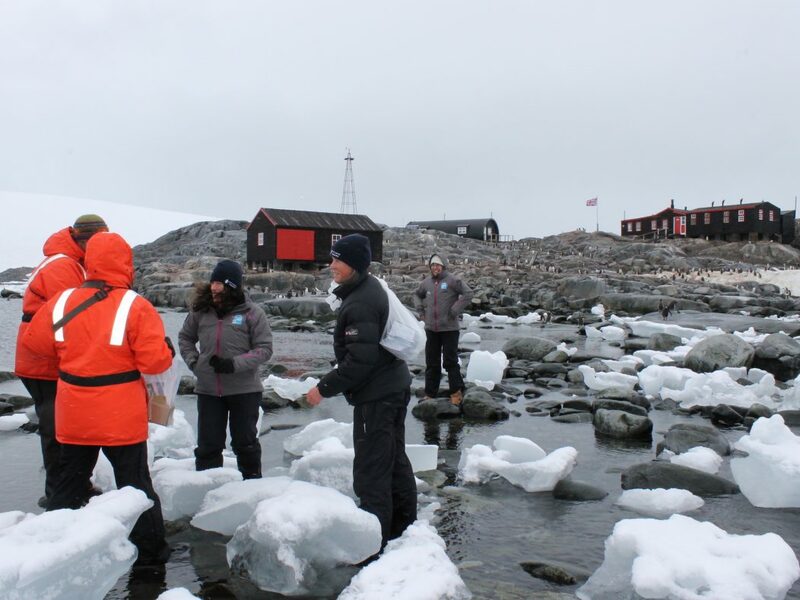 Penguin counter and Base Leader at a small station called Port Lockroy between 2013 and 2015, Sarah then led trips on polar ships along the Antarctic Peninsula and into the Weddell Sea for another two summers. She is in her element up on the bridge checking the wind and ice, on the water driving zodiacs between icebergs or ashore observing wildlife.